Here in The Cotswolds we are fortunate to be nearby some of the best festive destinations, events and shopping experiences you can possibly imagine. Therefore we only thought it appropriate to update our popular listing of seasonal events to present a truly comprehensive listing of Christmas events in the Cotswolds for 2018. Indulge in numerous artisans and bespoke retailers at Christmas Markets such as Bath, Cheltenham and Oxford. Not to forget Moreton in Marsh, Stow on the Wold and Chipping Norton Christmas Markets too. Christmas shopping includes such gems as: Burford Garden Company, Daylesford Organic and Bicester Village. Destinations with unforgettable festive experiences include: Blenheim Palace, Batsford, Sudley Castle, Gloucester Cathedral and Highgrove Estate. Visit the nearby, historic Cotswold market towns of Burford, Stow on the Wold, Cirencester and Chipping Norton. 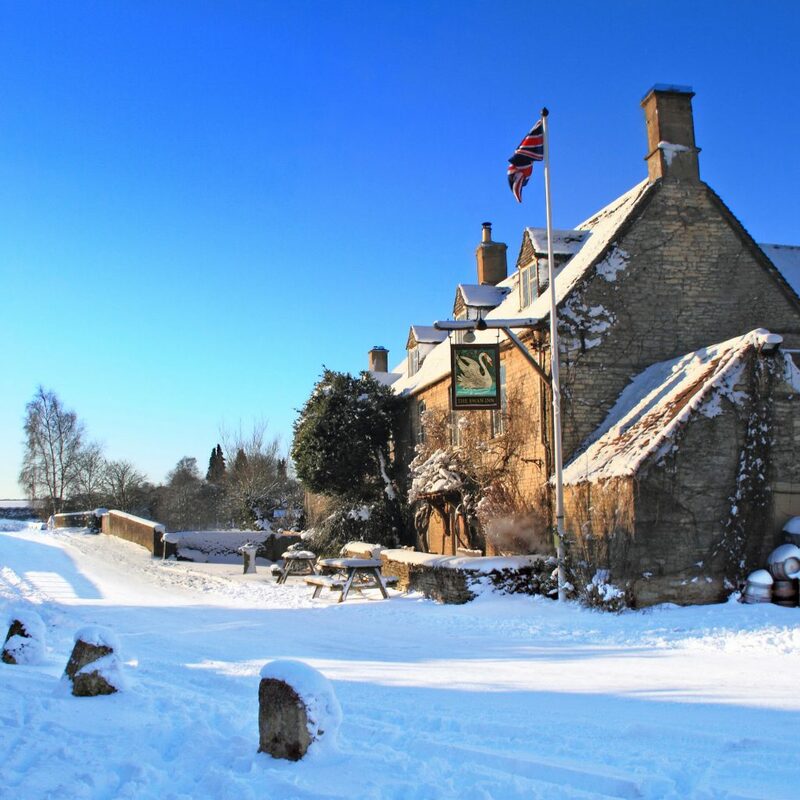 Why not use The King’s Head Inn at Bledington, or The Swan Inn at Swinbrook as the perfect base to explore some of our favourite festive experiences in the Cotswolds we’ve listed below…Or you can of course simply join us and relax. 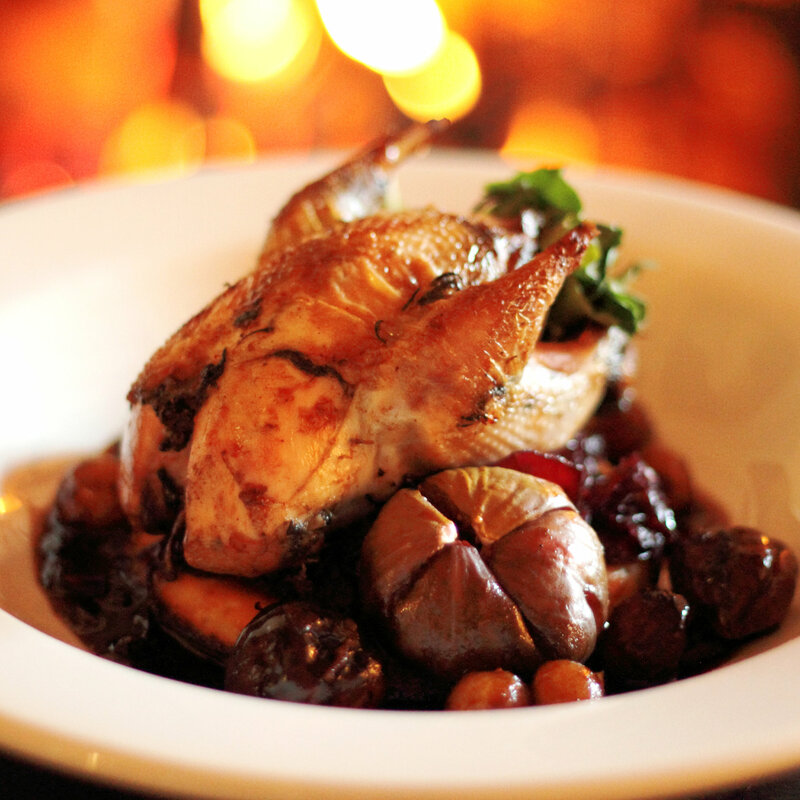 Curl up in front of a roaring fire soaking up the wonderful festive atmosphere after you have explored the surrounding countryside, striking local scenery and pretty villages of the Cotswolds. The restaurant and bedrooms are available for both food and accommodation for the entire festive season, the exception being Christmas Day and Boxing Day. On New Years Eve we will obviously have the usual knees up after some delicious seasonal food from our locally sourced menu. Please CONTACT US for any further information…Joyeux Noël. Every festive season Bath is transformed into a Christmas shopper’s delight, with over 200 stalls packed with wonderful Christmas gifts line Baths historic streets. Pipping hot mulled wine, warm mince pies, Christmas carols and family entertainment are just a small sample of many different elements that make Bath Christmas Market so special. More information about individual artisans and brands together with opening times can be found HERE. Batsford Arboretum is home to the country’s largest private collection of trees and shrubs. The Arboretum and shop is an wonderful place to visit, from the first snowdrops of spring, to the outstanding autumn colours of October and November through to the romance of the Christmas season. More information about festive events and opening times can be found HERE. We know Christmas is on the way @batsforda when Roger our Woodturner has carved his selection of reindeer! ??? Available in various sizes from £5 each! Established some 40 years ago Cotswold Wildlife Park is now home to one of the UK’s largest zoological collections along with it’s exciting gardens. Throughout the years millions of visitors both young and old have discovered the beauty and diversity of the natural world when visiting this very special family focused destination. Donner and Blitzen the resident Reindeer can be relaxing in their paddock for most of the year up until it’s time to help Father Christmas with his festive duties. More information about festive events and opening times throughout the Christmas and New Year period can be found HERE. The festive season at Cheltenham Racecourse includes not only horse racing but a rich selection of festive activities for racegoers whether friends, family or clients. Along with a range of dining and hospitality options there is the Christmas Party as well as a wide selection of carefully curated retail brands found in the Shopping Village. More information about race meetings, festive events and opening times can be found HERE. Together with a fine selection of Christmas gifts found in the Highgrove shop in Tetbury the Estate itself hosts it’s festive shopping and dining event where guests can view one-of-a-kind gifts, artisan wares, unique gift ideas, decorations and gourmet foods. More information and opening times can be found HERE. Chipping Campden’s beautiful Market Square is transformed into a festive destination full of artisan stalls offering a variety of arts and crafts, Christmas decorations, festive food, cards, toys and truly original Christmas gifts; everything you need for the perfect Christmas. Blenheim Palace Formal Gardens hosts an an annual festive Christmas event that includes an after-dark festive trail of light and a scented Fire Garden. Brightly-lit boats and dancing fountains will elumiate the lake with visitors completing their winter stroll by enjoying spiced cider, mulled wine or hot chocolate which accompanies toasting your own marshmallows. It’s beginning to look a lot like Christmas here at #BlenheimPalace… ?? 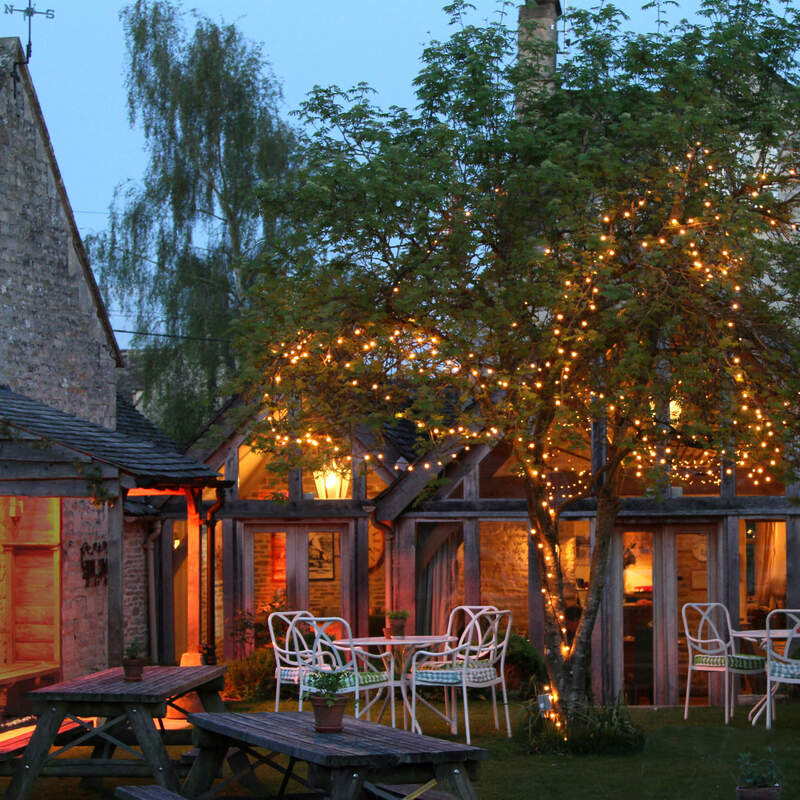 The well regarded Burford Garden Company hosts many events during the festive season. There is a rich scale and combination of Christmas presents from unique one-of-a-kind gifts by local artisans to a fantastic selection of food and wines. Artisan crafts, food and events at Daylesford ensures an amazing experience not forgetting truly unique Christmas gifts. The magical Cotswold town of Burford where you will find a a treasure trove of festive gifts and cheer behind the stunning architecture of these independent shops that line this timeless high street. Only a gentle walk via the Windrush valley from the The Swan Inn at Swinbrook. Top tip; retail therapy then return and relax with some festive spirit in front of a roaring fire. Situated in the beautiful setting of the Promenade under the Christmas lights, Cheltenhams Christmas Market features some 40 chalets selling a huge range of quality Christmas gifts, crafts, food and drink. This highly successful event is thought by many to be one of the best Christmas Markets of it’s kind in the country. From the first weekend of December until mid-January, visitors to Bourton-on-the-Water can experience a wealth of independent shops adorned with beautiful Christmas lights not forgetting the huge Christmas Tree dramatically located in the river. From Norman through Perpendicular to the present day Gloucester Cathedral is one of the finest medieval buildings in the country. It’s fan-faulted medieval cloisters and Great East Window are national treasures and the burial place of royalty. It has been used as the backdrop for many films including Harry Potter, Wolf Hall and Sherlock to name but a few. Throughout the Christmas season there are daily worships and many festive events in this most special of places. More information regarding events can be found HERE. Sample some Christmas cheer by exploring the illuminated trail around the Sudley Castle’s stunning grounds, marvelling at the majestic trees and romantic ruins all lit under the stars whilst enjoying a wonderful backdrop of music. Enjoy festive warmers including mulled wine, hot savoury and sweet treats on the castle terrace whilst experiencing this amazing spectacle. Oxford Christmas Market is situated in the heart of the city of spires on the beautiful and historic Broad Street. From colourfully decorated chalets with the aroma of mulled wine gently drifting in the air artisans offer unusual, sometimes unique, handmade gifts. All combine to make a visit to the Oxford Christmas Market a truly special Christmas experience. The perfect festive location to base exploring Christmas in the Cotswolds whatever your choice of destination or experience. Choose between the picturesque King’s Head Inn at Bledington, or the idyllic Swan Inn at Swinbrook. We would be delighted to offer advice or answer any questions you may have regarding any of the festive destinations in the Cotswolds listed above. We will be equally pleased to help with any requirements you have regarding Christmas Events or Accommodation. Why not contact The King’s Head Inn at Bledington, or The Swan Inn at Swinbrook or as all offer the perfect base to explore some of our favourite festive experiences in the Cotswolds. Additionally if you require any help with any accommodation or dining questions please CONTACT US. Stay at The Swan Swinbrook: MORE HERE.